Eating horses a solution to neglect and cruelty? We can answer that. 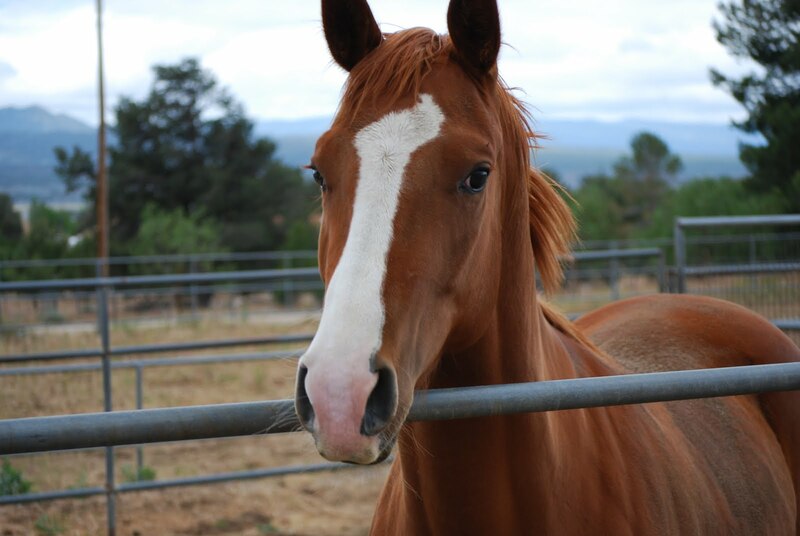 “Beauty was a ‘throwaway’, a horse on a slaughter-bound feedlot that nobody wanted. Well, I wanted her!”, states the woman who rescued her. Image: Remembering Beauty website. First of all, let us address what the real solution to the neglect and cruelty of horses is. All actions begin in thought. Until people experience the healing power that reforms the thought, it will not matter if there are hundreds, thousands or millions of horses, there still will be those who commit cruel and neglectful acts. For the purposes of this discussion we are talking about horses. Doug LaFleur has written an extensive article full of opinions, his and others, that for the most part are — with no intention of being unkind — not based on fact. Let’s take a step-by-step look and address the opinions that need correcting. LaFleur: Congress, faced with complaints over the unintended consequences of this ban [USDA no longer funding horse slaughter inspections], ordered the Government Accountability Office (GAO) to conduct a study of these effects which are contained in a June, 2011 report to Congress. TH: The study was successfully lobbied for by the pro horse slaughter faction in Washington DC, a report littered with misinformation and inconsistencies. The only complaints registered came from the animal agriculture lobby and its supporters. LaFleur: Among their most noteworthy findings were a major increase in domestic horses being exported for slaughter, primarily to Canada and Mexico. From 2006 to 2010 these exports increased to Canada by 148 percent and to Mexico by 660 percent. TH: This is correct. Exports indeed increased when horse slaughter plants ceased operating on US soil, and continues to do so. The number of horses slaughtered across US borders is the same if not higher than when horses were slaughtered on US soil. This singular fact completely destroys any and all arguments maintaining that since horse slaughter ceased on US soil more horses are abused, neglected and abandoned. The killing of American horses for their meat has not stopped. It moved across the border. Pacelle disputes the GAO’s conclusion that the slaughter ban contributed to abuse, neglect and abandonment. He says that the number of U.S. horses slaughtered remained constant, around 140,000, before and after the ban, whether they were killed domestically or in other countries. LaFleur: From the animal rights groups’ perspective this made an already bad situation worse in that horses were being transported long distances to facilities which lacked the protections for humane treatment that had previously been afforded by the U.S. Department of Agriculture’s regulatory oversight. TH: While this may have been believed at first, any group or individual who claims that statement is true is misled. Slaughter horses routinely travel long distances in deplorable conditions throughout the United States whether they are killed for their meat in the US or just across the border in neighboring countries. Cruelty occurs with all horses exported or transported for the purposes of slaughter. USDA-regulated horse slaughter plants in the US were in constant violation of the Humane Slaughter Act as was proved through numerous FOIA (Freedom of Information Act) documents collected by various horse and/or animal protection groups. Chief among these is a group called Animals’ Angels who specialize in tracking slaughter animals and investigating slaughter facilities. Animals’ Angels documented time and time again the atrocities committed against horses on the way to and during slaughter in the US. These horrific conditions and abuses are no more egregious than the acts committed against slaughter horses across US borders in Mexico and Canada. It is abundantly clear that there is no such thing as humane slaughter, especially in a commercial mass meat production setting. The phrase “humane slaughter” is a contradiction in terms. The slaughter of animals for any purpose cannot be made humane. TH: There are two simple contributing factors here: 1. Overpopulation resulting in horses with no place to go due to overbreeding. 2. Economic decline forcing people to give up their horses. TH: 100% incorrect. The US still has a an active horse slaughter market in operation, killing thousands of them per week for their meat. Horse slaughter can be a highly lucrative business. Let us have a modicum of pretense here. Those who are all for horse slaughter are motivated by one factor and one factor only — money. LaFleur: Breaux Bridge resident Glenn Patin, who has seen firsthand the result of these factors, has worked tirelessly to address horse neglect and cruelty that he alleges has taken place next door to his home. Patin related account after account of horses being severely neglected while the situation got little to no response from animal rights organizations and law enforcement authorities. He said he feels that the organizations he has provided this information to have turned a deaf ear. TH: The lack of response from law enforcement is nothing new. They are often overworked and underfunded. Sadly, this is also the case for equine rescues and sanctuaries. Organizations like theirs rely on donations and volunteers to operate. Due to the recession/depression many were full and could take no more horses. This meant they had to budget their time and other resources more carefully than ever. Some were even at times on the verge of closing. Considering the devastating state of the US economy, equine rescues and sanctuaries should be applauded not sanctioned for the marvelous work they do and continue to do. The same applies to law enforcement authorities who also must manage their time and money carefully giving priority to calls that relate to human needs first. Additionally, when charges are made in horse abuse case, the horse is the evidence. That means they need to be held pending the outcome of a Hearing, and perhaps even a Trial. This can be a very expensive proposition for a County already struggling with their budget. In cases such as these, veterinary bills for an abused horse mount up very quickly. If part of the judgment means against defendants mean they do not get their horses back, the County often sends the horses to auction trying to recover some of their expenses. These poor abused horses are then under threat of being bought by a kill buyer for a slaughter plant, with their cycle of misery beginning once again, this time resulting in certain death. LaFleur: Patin says that he and other members of the community, horsemen in particular, are outraged by the neglect and abuse that goes on unaddressed. TH: Sorry. A pro-slaughter horsemen in our experience — crocodile tears. Lafleur: Some relief in the abundant supply of cheap horse may be on the horizon. According to the Nov. 29, 2011, issue of the Christian Science Monitor, federal legislation was passed that month reinstates federal funding for USDA inspection of horse meat intended for human consumption. According to a July 19, 2012, article in USA Today, horse slaughterhouses are being planned in Missouri, New Mexico, Oklahoma and Wyoming. In Wyoming, state Rep. Sue Wallis, who wants to run slaughter operations in Missouri and Oklahoma, says that primary customers for horse meat are abroad. She goes on to say that there are markets in dozens of countries and horse meat is 40 percent cheaper than beef, so demand is rising as Europe’s economy worsens. TH: Just because there is a demand for horse meat does not mean the US should or must supply it. Sue Wallis and her colleague Dave Duquette are notorious for dispensing misinformation. Horse slaughterhouses have been planned, but Wallis has been foiled at every attempt to progress with her plans, and will continue to be so. With few exceptions, horse meat is not cheaper than beef in the countries where horse meat is eaten. Choice cuts are considered a gourmet item served in high end restaurants. Horse meat that is cheaper than beef occurs in sausage or salamis. Typical of these types of products, they are not made from the best cut of the horse. Lafleur: Proponents of the domestic slaughter ban say there should a ban on the exportation of horses for slaughter as well. But others say that a proven demand will stymie any attempt at choking off the supply. Temple Grandin, an animal behaviorist and consultant to the livestock industry, says horses would end up in an underground market in Mexico where “there’s no supervision at all.” Instead, she advocates humane slaughter facilities and independent video monitoring to ensure that horses are not subject to undue suffering. TH: We repeat. Just because there is a demand for horse meat does not mean the US should or must supply it. Not every horse slaughter facility in Mexico is EU-regulated so there already exists numerous situations where “there’s no supervision at all”. The phrase “humane slaughter” is an oxymoron. Slaughter is the violent death of a being or group of beings. There is no way to make death by violence humane. There is already video monitoring in many regulated horse slaughter plants. Undercover investigations exposing the monstrous treatment of horses in slaughter plants show that video monitoring does not prevent cruelty. Lafleur: While the debate rages nationally, the inhumane treatment of horses here locally will in all likelihood continue unless more resources are applied to the problem. Agreed, or until people change the way they think about horses for the better. Temple Grandin had a hand in the design of the slaughter plant Les Viandes de la Petit-Nations in Quebec. This plant was shown to be woefully inadequate, as they all are, for the special needs for horses. The basic design of the kill box created many, many issues for the horses who were given only a few minutes before being hauled into the bleed out room. There is an extensive report on these deficiencies at http://www.defendhorsescanada.org under the tag Investigations Pasture to Plate. Ms. Grandin keeps saying that the bad stuff happens when she’s not around. The bad stuff, for horses, is endemic in any slaughter plant as you CANNOT humanely slaughter horses or any other animal in an assembly-line manner. Even third-party monitoring wouldn’t work. By the time the viewer sees an infraction, the animal has already endured horrific suffering. if horses slaughter human’s meat to sell how u feeling, horses is very innocent and beautiful God made them on earth for handicaped, kids, adults and who problem health like depression or stress and horses alway be there for her or him make feel relax and happy instead kill horse, NO WAY to eat horse’s meat no way no way ….. THANK YOU SO MUCH FOR YOUR WORK ! ! I live in Belize and have a horse rescue there. The Belizeans are shocked that we would eat horses. Some American say the Belizeans are a primitive third world culture ! I don’t think any civilized nation eats horse meat or sends their horses to slaughter. It is not only cruel but also a gross betrayal of all they have given to mankind. Those are my feelings anyway. I am so glad you find this helpful Mixchel.